Fiddler on the Roof is once again delighting audiences, this time with an outstanding cast performing the full 3 hour long musical sung and spoken completely in Yiddish. For non-Yiddish speakers, there are two large screens on the sides of the stage showing all the dialogue in English and Russian. The production, which we attended on Monday night, is directed by Tony winner Joel Grey with musical direction by Zalmen Mlotek. It features Steven Skybell as Tevye and stand-up comedian Jackie Hoffman as Yente the matchmaker. You'll find it at the Museum of Jewish History in lower Manhattan in Battery Park. The show has received rave reviews every since it opened on July 4. It runs through September 2. 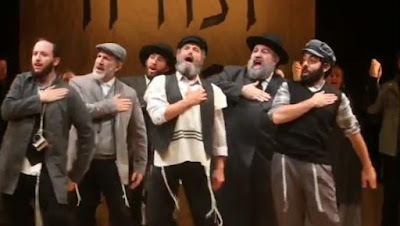 As of today, all performances are sold out, but the National Yiddish Theatre Folksbiene has posted a wait list where you can sign up to be notified of cancellations and available seats. Here's a TV news interview with Yente (Jackie Hoffman) in which she tells the backstory of how the non-Yiddish speaking cast took a crash course in the language and memorized their lines, and a video of highlights from the production. i hope they can video it totally for me.